We’d love your help. 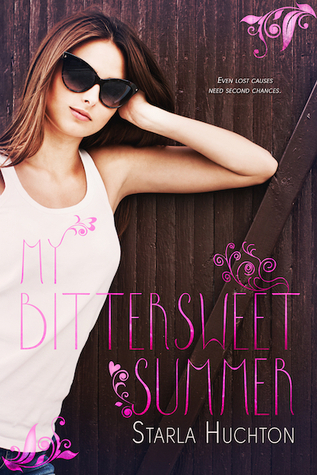 Let us know what’s wrong with this preview of My Bittersweet Summer by Starla Huchton. What was supposed to be her last summer of fun before moving to Paris turns into a nightmare as her parents announce they're taking over management of a restaurant in the Margaret Walsh worked for six years to overcome the trauma she endured at the hands of bullies as a kid, and graduation promises the chance to start over in college and leave the past behind her for good. To ask other readers questions about My Bittersweet Summer, please sign up. The first quarter of this book was a lot of filler. Conversations and events were repeated with the heroine's BFF. I read the story the first time around, I do not need to revisit it with the BFF. I understand that Margie went through with the bullies in her childhood, but now she just seemed moody with everyone. I did not really like her. I have NO IDEA why Zachery looked up to her and wanted to be by her. This did not flow for me. It felt like reverse bullying. Zachery I couldn't finish this one. I understand that Margie went through with the bullies in her childhood, but now she just seemed moody with everyone. I did not really like her. I have NO IDEA why Zachery looked up to her and wanted to be by her. This did not flow for me. It felt like reverse bullying. Zachery's friends bullied Margie years before and now it felt like Margie was bullying Zachery. Margie annoyed me. I could not connect. I usually love these type of stories. LOVE THEM, but the heroine has to be more likable for me to empathize with her. There are so many great stories like this where the heroine overcomes the bullying and becomes a better person, but Margie needs anger management and to focus on who to really focus her anger on. Her parents were jerks, but she was a jerk too at times. This did not work for me. It felt awkward. Not one character I liked or cared what happened to them. I had a hard time connecting with the characters of this story. At times I found her to be a little off putting and wanted to tell her to let go. Then I would end up feeling badly for her at times but I wasn't able to fully connect with her character. Plus the hero Zach didn’t do much for me either his whole reasoning for his actions in the past and ‘feelings’ for the heroine didn't sit well for me. I didn’t feel any kind of chemistry between the characters either. I’m picky about YA books and I I had a hard time connecting with the characters of this story. At times I found her to be a little off putting and wanted to tell her to let go. Then I would end up feeling badly for her at times but I wasn't able to fully connect with her character. Plus the hero Zach didn’t do much for me either his whole reasoning for his actions in the past and ‘feelings’ for the heroine didn't sit well for me. I didn’t feel any kind of chemistry between the characters either. I’m picky about YA books and I really thought this one would be a hit for me but sadly it didn't meet my expectations. This review has been hidden because it contains spoilers. To view it, click here. Really, really liked this book. It was a Young Adult summer read with depth. Margie is forced to return to a vacation island with her parents when they accept a management position at an exclusive restaurant. This is something she does not want to do as it will lead her to confront some demons from her pre-teen past. She was horribl Really, really liked this book. Margie is forced to return to a vacation island with her parents when they accept a management position at an exclusive restaurant. This is something she does not want to do as it will lead her to confront some demons from her pre-teen past. She was horribly bullied by 4 super affluent boys when she was a young girl to the point of moving away, being in therapy for many years after and suffering from PTSD. At 18, she has one last summer before taking off to Paris for University and she is helping the parents with their new restaurant. in the time that Margie has lived elsewhere (6years) the boys have not changed but 1 of them wants to. Really liked how the author addressed someone's need to change and how it's something easy to say and want but really difficult to actually do. Margie is a smart, mature for her age and kind-these aspects to her personality may just be part of her nature and/or a result of the bullying and the therapy that followed but I like her. Despite all this, she is still flawed and still dealing with some of the issues. To my way of thinking, something that was so traumatic does not simply just go away and it is completely understandable for her to not want to give one of her tormentors a 2nd chance even when they ask and almost beg for it. She was mean but this I believe is also understandable - once again, she was tormented for a long time and he was a part of the group. People say he has changed but it's hard for Margie to see it because she is a part of her pain, her story. I believe that the author tried to address this when she introduced Carter another character that everyone warned Margie from going out with. No one wanted to give Carter a 2nd chance - they had him judged- but Margie had no problem with him because she was not caught up in his prior history of drama. I think Carter was also looking to start over but no one on the island could see it because they knew his history. Zach, one of her tormentors, asks for forgiveness throughout the book and for a 2nd chance because he wants to change. He has suffered loss and more than a little guilt in the years that Margie has been away and wants to be a different person-he doesn't know who or what he wants to become just something different. Old habits are hard to break though and Margie makes him regret that he blew his 2nd chance. Margie had made Zach work a little for his 2nd chance but was not going to stand by and watch him let his friends act like jerks. She saw an aspect of his personality and respected that it was not her job to change him but neither was it her job to stand by and watch this-she cut him loose. This event is what crystalizes what and how Zach needs to change. It's her way of being that allows Zach to realize who and what kind of person he wants to be and it's this aspect of the story that I love so much. She(author) showed us how he was a nice guy but that his friends and not standing up to them was a habit for so long that it was an instinctive reaction and hard to break. I also appreciated how the author also doesn't want to just let everyone off the hook and say that everyone can be redeemed or wants to be redeemed. It was a good read and I would definitely recommend and will definitely look for other books by this author. I wouldn't go so far as to say I hated all the characters, but I definitely didn't like every single one of them. I couldn't understand what Zach saw in Margie. Margie was constantly angry and kept attacking his personality, which for me was an act of bullying. Zach acted like she was this really nice and caring person for teaching him at work when she was insulting him half the time. I also didn't get their talk about 'percentage' of Margie liking him; it just seemed to go up even when Zach did I wouldn't go so far as to say I hated all the characters, but I definitely didn't like every single one of them. I couldn't understand what Zach saw in Margie. Margie was constantly angry and kept attacking his personality, which for me was an act of bullying. Zach acted like she was this really nice and caring person for teaching him at work when she was insulting him half the time. I also didn't get their talk about 'percentage' of Margie liking him; it just seemed to go up even when Zach did something stupid instead of going back to zero or something. I also didn't like Margie's parents. Her parents pushed her to stay in the island, where she was bullied and almost died and got PTSD. Then her mom would get disappointed in her when she ranted against the Robinsons...but then it turned out that they accepted hush money all those years ago. Margie argued with them with no real end to the conversations and then next scene and they were all okay again. Nothing was resolved. Margaret was horribly bullied by kids (mostly involving dead mice) and eventually got so badly hurt she was hospitalised for a while and her family moved away. She got 6 years of therapy and is ready to go to university in France. But surprise! Her parents take a job in the first town, giving her 2 days notice so she has no choice but to move with them. She works in their restaurant, owned by the parents of one of the bullies, and they hire the kid, and make her work with him. You know exactly wh Margaret was horribly bullied by kids (mostly involving dead mice) and eventually got so badly hurt she was hospitalised for a while and her family moved away. She got 6 years of therapy and is ready to go to university in France. You know exactly where this is going, and it goes there, with an extra stupid side of "well, he only WATCHED his friends bully me constantly, so that's barely like bullying -- I never thought about that!" I spent the beginning of the book thinking what giant assholes the main character's parents were for taking her back to a place where she was horribly traumatized. The middle was...meh. And the end? I literally rolled my eyes at the epilogue. Like, laying in bed and reading my kindle, I rolled them like a teenage girl whose mother just asked her to clean her room. The last two chapters killed me with their terribleness. Margie was terribly bullied as a child by a group of rich boys. After they caused a head injury that left her hospitalized, her family moved away and she spent the next 6 years in therapy to treat the emotional damage they caused. Even after years of therapy, she's still plagued by stress migraines and panic attacks. Despite this, Margie is an incredibly driven person and her dream is to become a chef. She's received a scholarship to study in Paris and plans to spend her last summer preparing fo Margie was terribly bullied as a child by a group of rich boys. After they caused a head injury that left her hospitalized, her family moved away and she spent the next 6 years in therapy to treat the emotional damage they caused. Even after years of therapy, she's still plagued by stress migraines and panic attacks. Despite this, Margie is an incredibly driven person and her dream is to become a chef. She's received a scholarship to study in Paris and plans to spend her last summer preparing for it. When her parents are given an opportunity to manage an upscale restaurant, Margie is forced to move back to the same town where she was tormented all those years ago. She dreads meeting the group of boys who made her life miserable. Sure enough, she runs into them right away and nothing seems to have changed. Except for one person, Zach Robinson. Zach insists that he's changed and that he wants to show her that he's a different person now. But Margie's fears aren't so easy to overcome. This was an intense read that held me from the first chapter. It's a wonderful story about second chances, overcoming challenges, and personal growth. I loved the author's writing style, it's a good slow burn. This was a clean read. This book didn't feel like a typical YA novel, mostly because of the maturity of the characters. Margie was hardworking and responsible, and showed a depth and dedication I don't usually see in teen reads. She had her flaws, she had trouble controlling her anger. But this was balanced by her work ethic and innate kindness, and it just made her more real. Both Margie and Zach were well developed characters. In the beginning, I was conflicted about what I wanted for Zach. The story was told from Margie's point of view, so the only evidence we had of his efforts to be a better person is what she saw. When he did things like locking the car door so she couldn't leave, and grabbing and kissing her against her will, those were red flags that just showed he hadn't changed. I loved that Margie called him on his stalker behavior. By the end, the author had really brought the story full circle and I was rooting for Zach. I can't remember what originally made me purchase this book, but it's been sitting on my Kindle a while, and when I recently noticed that Gail Carriger had given this a 5-star review, I knew I had to give it a shot. I like that this book really emphasizes the awfulness of bullying. It wasn't just some schoolyard shoving around or name-calling - among other things, they used to throw dead mice at her. She suffered a near-fatal head injury trying to escape her tormentors. Since it's narrated from I can't remember what originally made me purchase this book, but it's been sitting on my Kindle a while, and when I recently noticed that Gail Carriger had given this a 5-star review, I knew I had to give it a shot. Margie was bullied relentlessly as a child. It was only when her family moved that she was able to slowly recover and become a stronger and more put together person. It took her six years to gain back her confidence and decrease her panic attacks, but it takes all of one look at the boys who were her biggest tormentors to tear down all the defenses she’d built up. She needs a letter of recommendation from the new chef at the restaurant her parents work at, so she can’t just leave. One boy in par Margie was bullied relentlessly as a child. It was only when her family moved that she was able to slowly recover and become a stronger and more put together person. It took her six years to gain back her confidence and decrease her panic attacks, but it takes all of one look at the boys who were her biggest tormentors to tear down all the defenses she’d built up. She needs a letter of recommendation from the new chef at the restaurant her parents work at, so she can’t just leave. One boy in particular, Zack, keeps bothering her. He isn’t the bully she used to know, but can she get over the fear she still has of him and the others and of getting hurt again? Starla Huchton has done it again. I couldn’t put down My Bittersweet Summer. The book flowed from beginning to end and held its tension and my attention throughout the entirety of the story. I always love Huchton’s characters. Margie has so much personality and her past, though only told in bits and pieces throughout her present day life, is so alive for the reader. The events in Margie’s past made her who she is and shaped who she has become. Present Margie is a product of Past Margie, but she has worked hard to become a new Margie. Going back to the place where her bullies tormented her would break anyone. Margie is not a super human, she is susceptible to bouts of panic and emotion when she has to confront the same bullies all grown up. She reacts with words and even her fist at one point, but there are other factors that keep her from losing all control. She can’t beat up the restaurant owner’s son. She can’t kill her chance to get that recommendation. She can’t let her parents down. She’s forced to confront her fears and her tormentors and to rise to the challenge Zack presents. Zack. I love a person who is trying to be a better person. He has a lot of past to overcome as one of those that stood by and let Margie get bullied. The ones who do nothing are just as guilty as those who are at the front of the assault. Zack has a lot to make up for and the way he tries is super sweet. I loved all his gestures and how hard he tried. Check out my review on my website! This book is amazing. I went through every emotion possible on the rollercoaster journey I shared with these brilliant characters. Zach was the definition of spoiled rich boy but people change. Margie's story, sadly happens daily to children everywhere. The emotional tale of her childhood and her trying to over come it kept me at the edge of my seat with anticipation. A must read. Love it. This was a pretty good book. I Liked the characters and the story line and that the relationship took time to develop. The hero was flawed..no doubt about that, but he was likable and improved over the course of the book. What a great book. Well written, great story and the characters are sweet. Its a lesson to all if us.....seconds are worthy.